Street Art News | Oi YOU! Oi YOU! 's street art events look great on video and camera and always attract a great deal of media attention. Oi YOU! events attract a lot of media attention. 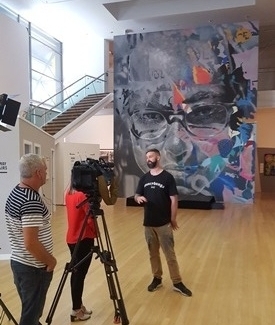 Our latest show Paradox in Tauranga featured multiple times on national Television. On the the left is a feature presented on TVNZ's 1 News and right is Askew One being interviewed by TV3's Newshub reporter Melissa Davies.